Kerley’s fourth Carson Ryder thriller finds the young Alabama detective temporarily leaving behind the sweltering South. A mysterious video found at an appalling mutilation-murder quite literally calls Ryder to the bright lights and shadowed streets of New York City, where he battles hayseed prejudices held by city cops barely tolerant of his presence. For three novels Ryder has solved despicable murders alongside nattily-dressed veteran partner Harry Nautilus, while occasionally consulting the imprisoned brother he’s long kept secret - notorious murderer Jeremy Ridgecliffe. Now Jeremy has escaped and Ryder finds himself trying to outrun an NYPD manhunt in order to keep his secret safe and his brother alive. 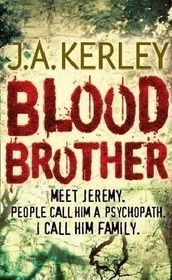 Once again Kerley spins a suspenseful tale peppered with vicious murders and exciting twists, although this time the twists not only upturn readers’ beliefs and expectations about this novel’s rapidly-evolving events, but also deliver surprising revelations about the throughline of the entire series thusfar. However, Kerley outperforms plot-driven twist-masters with the texture of his crime fiction; he also engages the reader with interesting characters, settings and themes. Any twists and turns seem organic, realistically evolving from such elements rather than being author-imposed to distract from deficiencies in the storytelling. Another excellent read in an underrated and very intriguing series.